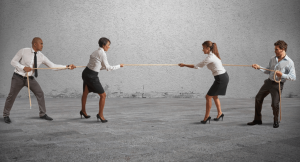 How many hours a week do you spend dealing with workplace conflict? According to a study by CPP Global, U.S workers spend more than 2.5 hours per week on conflicts, costing businesses an estimated $359 billion in one year. Conflict in the workplace occurs for a variety of reasons, including differences in communication style, motivations and priorities. Underlying those causes is often a lack of clarity and communication within the organization regarding goals, expectations and processes. Employees who lack guidance on their goals are at risk of missing deadlines or falling short on quality. A lack of accountability within a company can mean uneven consequences for poor performance. All of which leads, it seems, to conflict. According to a study by CPP Global, U.S workers spend more than 2.5 hours per week on conflicts. The costs add up. In the year the study was conducted, an estimated $359 billion in productivity was lost to conflict, based on an average wage of $17.95 per hour. For many, workplace conflict is a difficult challenge to face directly. Having a conversation about the conflict is so daunting that workers often go to great lengths to avoid it. Coping strategies include complaining to someone else instead, giving up on asserting reasonable needs, avoiding the other person, doing someone else’s work, or avoiding giving necessary feedback. All of these are short-term tactics, not workable solutions. In fact, the same CPP Global study noted that 89% of workers say they have experienced a conflict that escalated, rather than being resolved quickly. What approach do you typically take when it comes to dealing with conflict? Do you recognize yourself in any of the approaches mentioned above? Based on our recent blog posts, it is easy to see how some of the Leadership Archetypes might deal with conflict more readily than others. The truth is every style can find a way to deal with conflict effectively, even if it is a difficult task. How have you handled a recent conflict? Has your Leadership Archetype proven helpful or was it a hindrance? Tapping into the strengths of another leadership style or working with a team member with complementary strengths can prove effective in solving the next workplace conflict.